CS DispoPhos is animal-safe preparation of highest purity based on trivalent iron, intended for instant and controlled removal of phosphates from both seawater and fresh water. 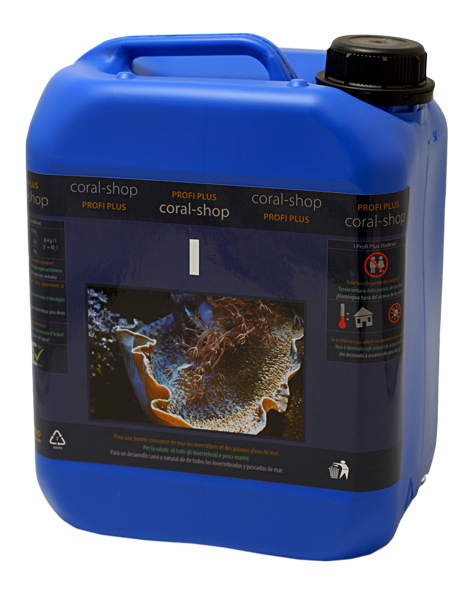 Preparation is intended for all types of marine and reef tanks, especially the ones with larger fish populations. CS DispoPhos instantly reacts with phosphates in water forming the precipitate which partially imbeds on bottom of the tank, is partially removed by skimming and caught in particle filter - if available. Mixture of inorganic ferric (Fe III) compounds. Immediately after the new sorbent is applied the absorption rate hits the ceiling and is higher than needed. Zero phosphorus concentration is undesirable - trace phosphorus concentrations in seawater are required - more information can be found in related article about phosphorus. Many sorbents also release unwanted matter - often toxic - at P1-period (curve x), causing sometimes pH value changes as well. In the course of certain time the absorption rate is optimal - phosphorus concentration is held on trace level. From certain moment - given by brand of sorbent and preceding phosphorus concentration - absorption rate falls gradually. The logical economical dilemma arises - when to proceed with sorbent exchange? Particularly at P3-period the sorbent can also be colonized by various bacteria and if kept too long time in a tank, unwanted biological processes can be initiated. 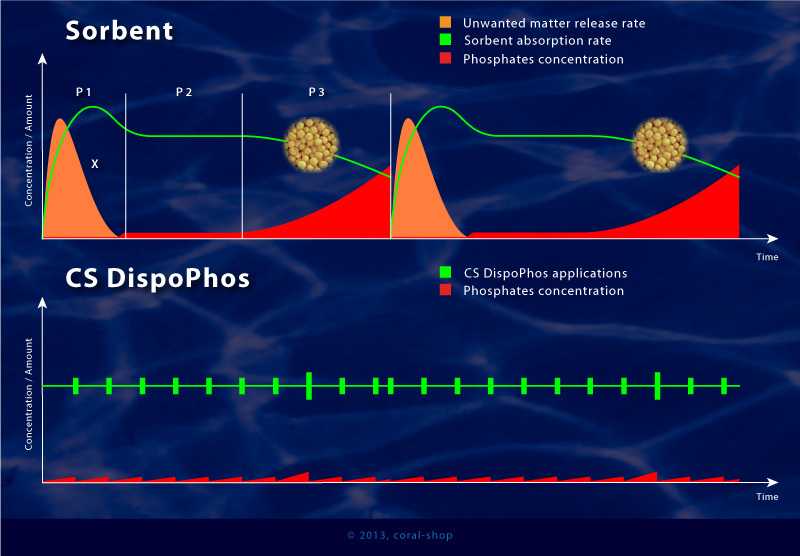 As results from the graph above, regular application of CS DispoPhos enables to maintain phosphates concentration on long-term stable trace level. There are no disadvantages of solid sorbents - the use of CS DispoPhos is targeted, controlled and economical. Based on the results of phosphate concentration testing CS DispoPhos can be applied in exactly required amount. Always use reliable phosphate test kit for determination of accurate dosing! Check determination of phosphates concentration can be made as early as 20 min. after CS DispoPhos application. Set the required dose on your dosing system - use maximum available number of cycles per day!